SiteDash Client is the companion package for SiteDash, allowing it to securely communicate with your site. SiteDash Client is available from the modmore package provider, and MODX.com. Free Extras from modmore can be installed through the modmore package provider. Please follow the steps below. If you do not yet have a modmore account, signup here. If you have an account, login. On your API Key page, create a new API Key. Open your site's manager and go to Extras > Installer and run the bookmarklet you received in step 2 to install the modmore Package Provider. Click the arrow next to Download Extras and choose Select a Provider. In the popup, choose the modmore provider that was just added. In the tree on the left side choose Free Extras and then All Free Extras and find the package you wish to install. Hit Download. Close the Package Browser, and install the package as you would do with normal packages. 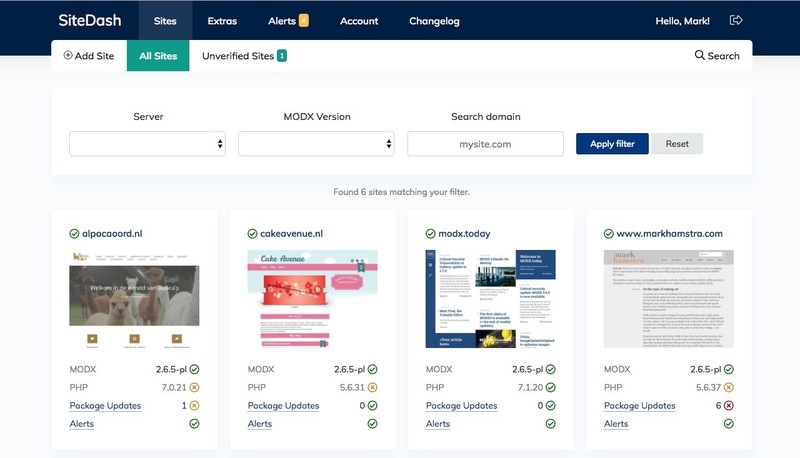 Not all Free Extras that modmore maintains are also available through MODX.com. For those that are, you can use the default Package Provider in MODX to find and install the package. On the MODX Extras website it is also possible to download the package zip to do manual installations, though we do not recommend that.